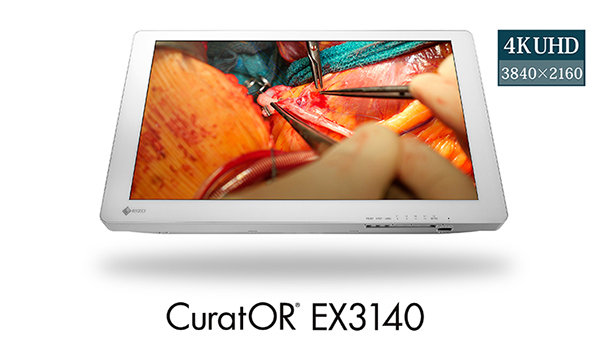 Hakusan, Japan, November 7, 2017 – EIZO Corporation (TSE: 6737) today announced the third introduction to its line of surgical and endoscopy monitors with the CuratOR EX3140 – the first 4K UHD (3840 x 2160 pixels) surgical monitor in the CuratOR lineup. The EX3140 features a resolution four times greater than a full HD monitor. It clearly displays images taken by 4K endoscopy and surgical microscope cameras and makes otherwise difficult-to-see artifacts more visible. Using EIZO’s Smart Resolution with Sparse Coding (S.R.S.C) proprietary technology, full HD images can be enhanced to a 4K resolution without any lag, making full use of the monitor’s 4K resolution. The monitor displays a wide color gamut, emulating the 4K UHD video color standard BT.2020. Not only does it faithfully reproduce the sRGB color gamut, but also displays the increased range of yellowish-green to red colors that BT.2020 compatible cameras are able to capture. 4K UHD resolution can be transmitted via DisplayPort 1.2 and Quad Link 3G-SDI (BNC). With DisplayPort 1.2, data is transmitted at 60 frames/second through a single cable. Additionally, the cable locks into the monitor and cannot be accidentally pulled out – ensuring consistent and stable connection at all times. The 3G-SDI (BNC) can transmit a signal over long distances of 30 meters. EIZO will continue to expand on this new line of surgical monitors, with varying resolutions and sizes, to respond to the diversifying needs of the healthcare industry. The CuratOR EX3140 will begin shipping from April 2018. Date of availability varies by country so contact the EIZO group company or distributor in your country for details.